The second-most important pitch for start-ups, after the investor pitch, is the analyst briefing. These are the formal oral presentations which are more or less mandatory for any new solution coming to the IT or telecoms markets. This month I’m gathering data from over 100 professionals who take part in pitches, looking to understand what really happens. The first big fact is that preparing for the analyst pitch is not like the investor pitch: that’s especially bad news for start-ups who send to the analysts a team prepared for their elevator pitch to venture capitalists. The chart above gives you a few headlines. 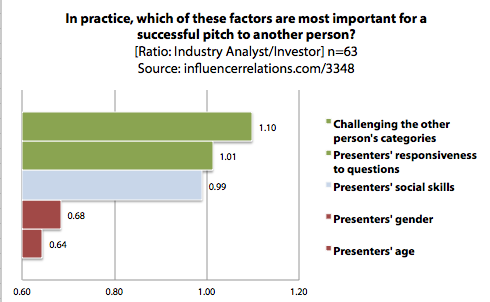 It compares the views of participants in analyst pitches with those in investor pitches. The age and gender of attendees is way more important when meeting investors: around 50% more important. But there is one key factor that analysts expect more of: challenging the participants ideas about market categories. Compared to meeting investors, or to most pitches generally, information sent in advance of analyst briefings is often less important. Respondents to our survey often complained when presenters focussed on a sales pitch about their solution, or used one-sided information about the market environment. Pitches to analysts need to be as adaptable a conversation: that requires serious preparation to give an honest view of the demand for the solution, the competition and the market context while listening for comments, looking for non-verbal cues and encouraging discussion around the analysts’ market viewpoint. Over the next few months I’ll be deepening this thread of research around the pitch, working with colleagues at the University of Edinburgh Business School. We’re looking for firms to sponsor the research past the initial phase. Please contact me if you’d like to find out more. Previous Previous post: Why Have An Analyst / Consultant Relations Programme?